Did you know that 40-60% of your home’s energy bill is wasted? That’s right! The US Department of Energy reports that about half of a home’s energy is wasted when it is under-insulated and improperly air sealed. You can save $500 to $1,000 per year on energy bills by having your home properly insulated and air sealed. How do you know if your home has enough insulation? Most homes 10-years or older do not have enough insulation according to the International Energy Conservation Codes (IECC). Your NARI Remodeler can help you understand what needs to be done to meet the building codes. Plus, your NARI contractor can advise you on what options to consider for properly insulating your home for energy savings, comfort, and health. The bigger question, is your home effectively air sealed? There are several components to proper air sealing. The biggest and most important aspect is insulation. While there are many different types of insulation, only one product is an excellent air sealing solution: spray foam. It is the only type of insulation that stops all 3 types of heat transfer. Here you can take a deep dive into learning about spray foam insulation. Can your house be air sealed even if your home has fiberglass, cellulose, or rock wool insulation? Yes. People are using cans of spray foam to seal the around common air leak areas like: electric outlets, windows, doors, HVAC ducts, framing connections, and plumbing entries. Then they fill the rest of the area with another insulation material like fiberglass. It works. Which area of your house is most important to upgrade? The attic is where the majority of your energy is lost. In the Austin Texas area, your attic is where most of the heat comes into your home during the long hot summer months. There are two different building science methods used in attic insulation: vented versus sealed building envelope. If you have a vented envelope with insulation laying on the attic floor, your attic will be 130-150-degrees in the summer. However, with a sealed envelope, your attic should be 3-5 degrees warmer than the conditioned living space in your home. What is the cost difference between the methods? A vented attic seems cheaper when only considering the cost of blowing in fiberglass. However, when you add in the cost of attic fans and radiant barrier to get a lower attic temperature, then you will be much closer to the cost of a sealed attic. How do you know if it worth creating a sealed attic? If you are simply fixing up the house to sell it in the next 2-years, go cheap. If you are going to be paying the utility bills, and will own the home for 3-years or more, invest in a sealed envelope. Your return on investment (ROI) over a 3 year period should be positive, and a 30 year ROI is tremendous. When is the best time to have your home properly insulated? During remodeling the sheetrock is removed from your walls. That is the only time you can remove rodent infested, damaged, improperly installed insulation. Then your NARI remodeler can have an insulation professional install the proper insulation correctly. Your remodeler’s job is to give you what you want, while complying with the building codes. Your remodeler is only required to address the insulation on walls, ceilings, and floors that are opened up. That means that if only half of your home’s walls have the sheetrock removed, then only half of your home’s insulation is fixed. Plus, in most cases, the contractor is not required by the municipality to bring the attic insulation up to code. Remember, your attic is the most important place to upgrade. If you are building an addition, the new space will have the proper insulation. The existing structure will not be upgraded unless you require the upgrade and put it in the budget. Here is what to do next: If you want to have a healthy indoor environment that is comfortable, and saves you money on utilities, then talk to your NARI remodeler about proper insulation. Shawn Mansur is the founder of Stellrr Insulation in Austin TX. Shawn is famous for his 200% Money-Back Guarantee. He is laser-focused on delighting every client while helping them achieve stellar performance in their homes. Plus, with every purchase, Shawn gives 10% of the profits to the cause of the client’s choice. Learn more at https://www.stellrr.com or call 512-520-0044 today. Spring is here! The grass is green, flowers are blooming, and it’s the perfect time to enjoy your outdoor space before the heat of summer. For deck owners, all you have to do is just step outside onto your porch or back deck and soak up the sun, right? Not so fast. If you own a deck or porch, you know there’s work to be done! After fall and winter, there’s bound to be stains, dirt, and grime that has been left to sit and settle into the boards and between the gaps. Before you bring the lounge chairs back out, there are a few ways you can actually ruin the look of your deck if you’re not careful. If you think the wind and rain that come during the spring will clean your deck or porch for you, think again. All the elements can do is move around dirt and grime, not remove it. Allowing any part of your deck to accumulate dirt, leaves, and anything else in between the gaps of your deck boards can lead to serious issues. Any organic matter that’s left to rot can cause discoloration and premature rotting of wood (especially softer woods like pine and cedar). Also, because water tends to accumulate in any area where it cannot run off, it will pool and potentially cause your decking to warp and twist. Do your boards a favor, mind the gap and clear them out thoroughly. So, let’s say you have a new deck made of Ipe and it’s due for its very first annual refinishing. Instead of reading the directions, you simply sweep off some leaves and dirt and apply the oil. Everything looks fine the first day, but after a while you notice strange markings on your deck. Surely, it must be the oil! Nope. The oil did its job. Unfortunately, it’s not enough to sweep off your deck prior to oiling it. 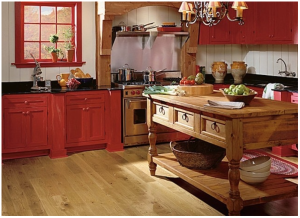 It has to be thoroughly cleaned so the finishing solution of your choice can adhere to the grain and protect the wood. If there’s dirt still left in the wood, the oil cannot properly soak into the surface. 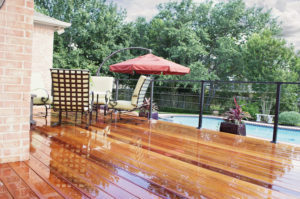 Use a wood deck cleaner and brightener to prevent giving yourself more work and an ugly deck to look at. into the wood, the finish became uneven. To prevent this from happening, make sure your deck is completely dry 24 hours prior to and after applying any finish or sealer. The best way to ensure you never make these mistakes is by building a deck out of composite decking. Popular brands like Trex, TimberTech and Fiberon are wrapped in a protective plastic shell which won’t rot and come with 25-year stain and fade warranties. You can also use a 100% PVC product like Azek or Zuri which don’t use any organic materials and have longer warranties. Composites are the best low-maintenance option since all it takes is a little soap and water to keep it looking brand new. Avoid these mistakes and you can give yourself the best chance of not spending a lot of time and money on future deck maintenance and repairs. Instead, you can clean your deck, apply a finish, and enjoy it for the remainder of the year. Or, you can build a composite deck and save yourself a little time and elbow grease. Remodeling your home can be an overwhelming endeavor, but it may be exactly what you need in your life right now. You can turn your house into your dream home where the rest of your dreams can manifest. 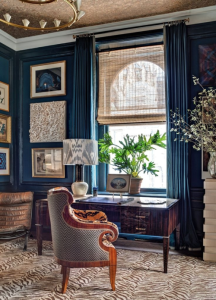 Remodeling a room will spark inspiration, creativity, and perpetuate new goals. At Modernize, we love to see homeowners find new life in their homes through simple DIY projects or major renovations. Need a little push out of your remodeling comfort zone? Here are the top reasons why a home remodel is just what you need in your life. Don’t waste another year with items that you don’t love or that don’t serve you well. The very trendy and popular book, “The Life-Changing Magic of Tidying Up” by Marie Kondo addresses the need to get rid of anything that does not “spark joy.” Many of my friends have been using this book to clean out their closets and junk drawers, but I believe this is a useful exercise when it comes to home fixtures as well. I am vertically challenged and find it a nuisance to drag my step stool around the kitchen for items that I use every day. My small DIY project for spring is to place a shelf that runs the length of all of my wall cabinets, so I can have easy access to items that I need every day. If you have a leaky faucet that multiple repairs have failed to fix, it’s time to upgrade once and for all. Invest in something beautiful and functional so that you are not annoyed every time you take a shower and have to jangle the fixture to turn it off. Simple fixes will improve your quality of life. There will be less time to grumble about inconveniences and more time to love the room that you are in. If you have the means to make big changes this year, consider creating your dream space for your passions. If you love to cook, create the kitchen of your dreams. Are you a writer or an artist? Imagine an addition that is dedicated to your craft. Surround yourself with the tools and space that you need and watch your talent blossom in the most ideal environment. If you are not worried about distractions or inconveniences, you can focus on your hobby or your work. Sure, you can make do with what you have, but if it’s possible to truly love the space where you are performing your passions, your creations will benefit from your bliss. Put some work into your home now so you can pour your heart into your art, cooking, or other hobby later. Maybe you can imagine your dream home, but it’s located somewhere else. If you know that you need to sell in the future, making renovations will help increase your home’s resale value, and also make it more enjoyable to live in until it’s time to go. My husband and I intend to do just that with our 1980s bathroom. I know that we eventually want to move into a new home in a different neighborhood. But this move is at least a few years away, and I don’t want to live with my outdated bathroom for that long. 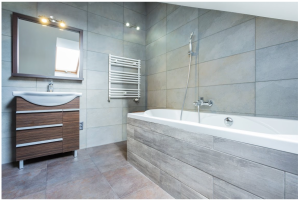 While my husband and I will not be spending money as if this is our dream master bath, we will be happy to retreat to a sparkling clean bathroom with modern cabinets and updated lighting fixtures. We are staying neutral and bright to appeal to potential buyers in a few years. Remodeling takes a lot of planning, patience, and money, but you will realize that those minutes, deep breaths, and dollars were well-spent when you love walking through the door of your home. There are so many benefits to owning your own home, the least of which being the freedom to complete home improvement projects however you like, whenever you like. Of course, with such freedom comes great responsibility, and even greater choices. 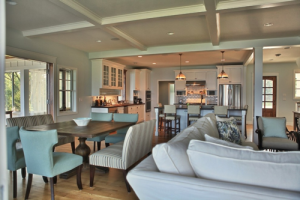 If you’re struggling to choose from your list of remodeling projects, let us help you decide. Here are five of the top home improvement projects that will help you and your home stay up to date (and on trend) in 2016. If you’re itching for a significant remodeling project, consider opening up your living space. Channel Chip and Joanna and give your home a Fixer Upper style remodel by breaking down non load bearing walls and creating a large, open plan area in your home. We particularly love the idea of an open plan kitchen and dining room area that will bring the heart of the home, not to mention your family, together. For tired, outdated kitchens, choose an on-trend remodel like one of Forbes’ list of 9 Kitchen Trends to Watch Out For in 2016. From muted tones to high-tech kitchens (think hidden charging stations in your work surfaces, integrated lighting systems, and smart appliances), this list has it all. 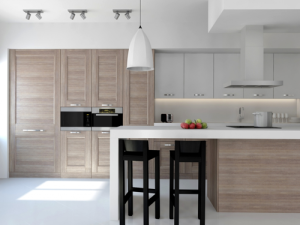 At Modernize, we love clean, traditional kitchens with perfectly placed details (think stylish Scandinavian simplicity). If you want to kill two home improvement birds with one stone, bring your kitchen and living areas together by knocking down adjoining walls and updating your kitchen with a large, functional island with seating. 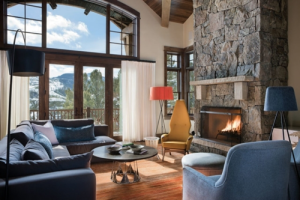 While it might seem like the wrong time of year for a fireplace project, it’s actually perfect if you want to do a large scale remodel or installation of a new fireplace, which will substantially increase the value of your home and offer a sustainable heating source for living spaces. For a less costly but equally fun DIY project, upgrade and restyle your mantel area with reclaimed wooden beams or stone, adding a bold modern art print or a few heirloom home decor pieces to complete your look. 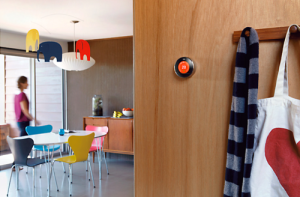 Bring your home fully into the 21st century by installing smart thermostats and/or other home automation products such as integrated HVAC, lighting, and security systems throughout the home that allow you to access and change preferences even when you are away from home via smartphone and tablet applications. These kinds of high tech products may cost you initially, but are more than worth it in the long run in terms of energy savings, decreasing bills, and convenience with regards to home connectivity. The best part about these kinds of systems is that they are usually very straightforward to install and are fully functional within minutes. Never underestimate the power of a coat of paint. 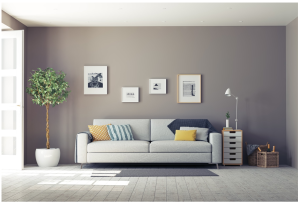 If you want to change the look and style of your home without knocking down walls and completely renovating rooms, a simple paint job with quality materials will instantly do the trick. Stay up to date with the latest color trends, which include jewel tones, neutrals (make sure to offset the lack of color with bold, bright home decor accents), black, and even white (Benjamin Moore’s Color of the Year for 2016 is Simply White). For something completely different, consider the Pantone Colors of the Year for 2016, which are an intriguing and subtle combination of Rose Quartz and Serenity, or pink and blue to the less artistic homeowners among us.